Of the Ten Rays of Sisterhood, Sigma Psi Zeta’s foundational pillars, the Culture Ray is truly one that Sigma has grown to embody as part of its national identity. As a multicultural, Asian-interest organization, part of our mission is to promote the awareness of Asian and Asian-American cultures and heritages. One way we carry out this mission is by hosting cultural events on our campus that celebrate different traditions from East Asia, Southeast Asia, and South Asia. The sisters of Pi Chapter come from a diverse array of cultural backgrounds and have been especially active in representing southeast and south Asian heritages through past events, including a presentation about Indonesia and its traditional cuisine and dance workshops in collaboration with GW’s collegiate Bhangra dance team. To continue this tradition of diverse cultural representation, and as co-culture chair this semester, I have organized, along with my sisters, an open, university-wide Holi Celebration with GW HSA and GW Desis to share a beautiful part of my culture with the GW community. 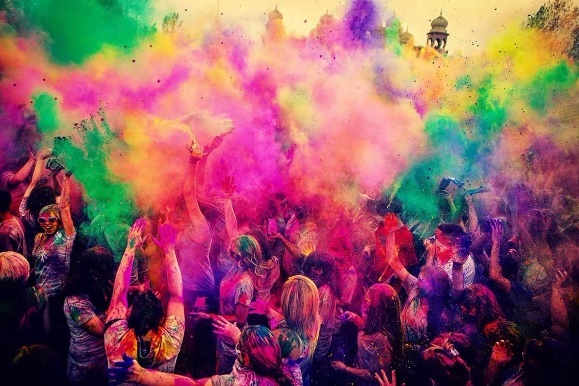 Holi is a Hindu springtime festival known as the “festival of colors” around the world. Spring symbolizes new beginnings and the celebration represents the triumph of good over evil. It is a time when people come together to play, to forgive and to strengthen community bonds. This celebration embraces positivity, happiness, love and acceptance. The origins of the traditional throwing of colored powder are rooted in Hindu mythology and commemorates the divine love of Radha, goddess of kindness, love, and beauty, for Krishna, one of the major Hindu deities. The legend goes that Lord Krishna often complained to his Mother Yashoda about his dark complexion, and his blue skin, and wondered if any of the other fair-skinned girls, especially Radha, would ever like him because he was different. One day his mother playfully told him to color Radha’s face and change her complexion to any color he desired. 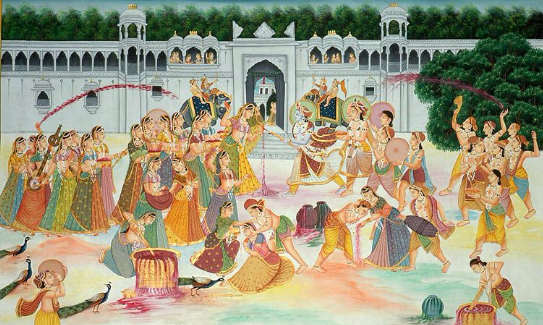 Listening to his mother, Krishna smears color on Radha’s face and they eventually become a couple. 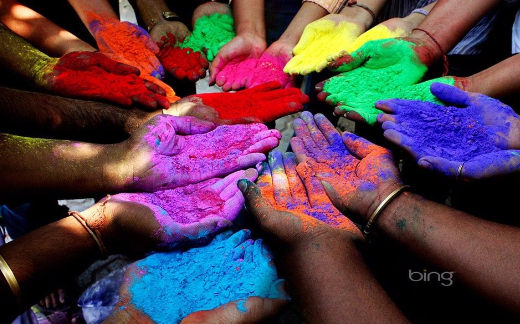 This introduces the colorful festival of Holi and the tradition of throwing color onto friends and family. 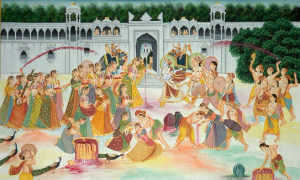 To this day the festival involves smearing color on the faces loved ones, with colored powders and pichkaris (essentially water guns), to show one’s affection for others. Surrounded by music, dancing, singing, and above all, FUN, all who partake in this exhilarating tradition will feel rejuvenated by the positive energy that this festival emanates. So take a break from any stress that you feel and come celebrate Holi with the sisters of Sigma Psi Zeta, GW HSA, GW Desis and all of your friends on April 1st between noon and 4:00pm in Square 80! We will have colored powder for everyone to play with, refreshing snacks, a photo booth and a special performance by the Sigma sisters to celebrate this festive time! 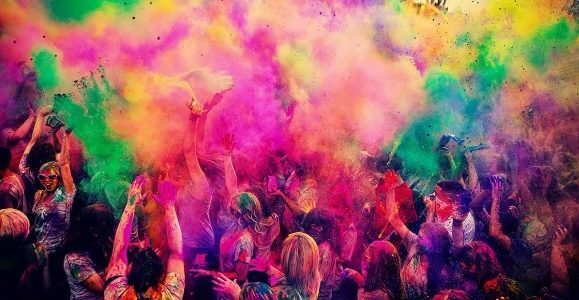 For more information see our Facebook event page for HOLI 2017! Speaking of Sigma Psi Zeta’s involvement in cultural events on campus… come out to GW Hawai’i Club’s 19th Annual Luau: The Legends of Maui! This is an annual event which Sigma Psi Zeta co-sponsors and many sisters have helped put together and partake in through traditional Hawaiian dances and songs.